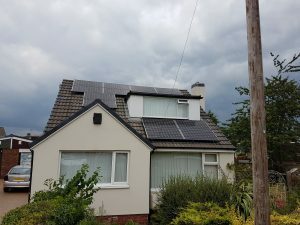 This customer in Swinton had solar panels fitted to his house by another company back in 2011. That company has since ceased trading. Following a recommendation from a friend, he contacted us to enquire about adding battery storage to his solar PV system. The house has 14 Panasonic 235W solar panels, totalling 3.29kW. During the survey it was found that his existing inverter was a Fronius 2.5kW model – a good inverter but undersized for his installation. This would result in ‘clipping’ of his generated electricity, which means that on the brightest days when his solar panels could produce in excess of 3kW, the inverter could only allow 2.5kW to be generated. A 3kW inverter would have been a more appropriate choice. It was also obvious that some of the existing panels would suffer from shade, particularly those on the lower part of the roof and those immediately next to the dormer window. As the panels were connected together in a ‘string’ system, the affected panels would also reduce the yield from unshaded ones. We therefore settled on upgrading the system to use SolarEdge technology. This involved adding SolarEdge power optimisers to the system, then replacing the existing inverter with a correctly sized SolarEdge inverter. This means that each and every panel can work at its best, with each one being monitored separately. 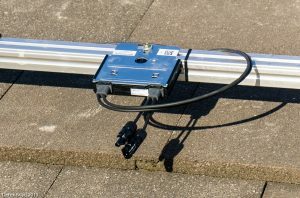 The solar panels were temporarily removed from the mounting system, then a SolarEdge power optimiser was fitted behind each panel. The serial number and location of each power optimiser was carefully recorded, so that we could input the layout into the monitoring system. The panels are then re-fitted, each one connecting to its own power optimiser. 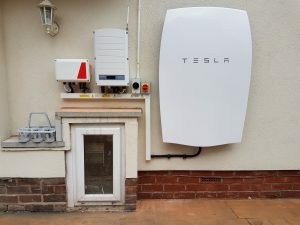 A Tesla Powerwall home battery was also added to the system. As SolarEdge is 100% compatible with Powerwall, the solar panels charge the battery directly with the d.c. electricity they produce. The obvious benefit of the battery is to store electricity when the solar panels are producing more than is being immediately used in the household. It can then be used both during the day to augment the solar panels for heavy loads such as laundry appliances, and also into the evening and at night to support the electricity demand of the house. As the house electricity supply happens to be on an Economy 7 tariff, the customer enjoys a low ‘cheap’ rate of electricity during the hours of 12:30 a.m. and 7:30 a.m., whilst paying a higher ‘peak’ rate at other times. During the summer months the solar panels will reduce much of the demand for peak-rate electricity. During the winter months however, the solar panels will not produce as much electricity. We have therefore programmed the system to help out in the winter by charging the battery overnight on cheap-rate electricity and allowing the household to use the cheaper power during the day. This will result in a lower requirement for the more expensive peak-rate electricity. 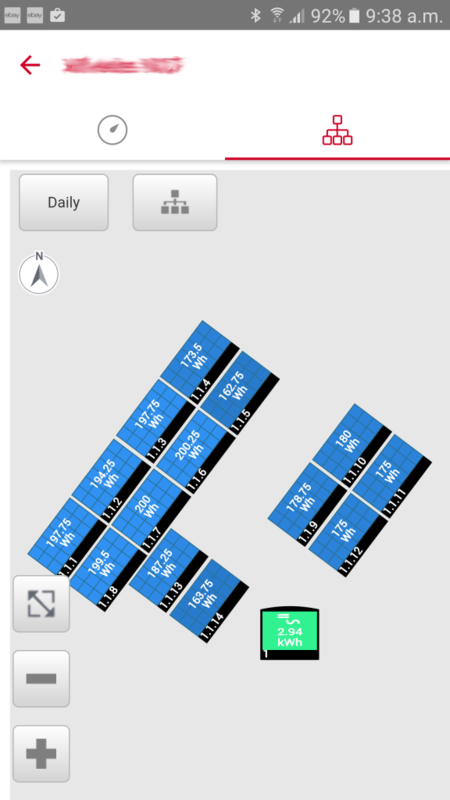 To the right are snapshots of the system’s performance as shown on a smartphone. Apps are available for Apple and Android devices. This can also be displayed in any browser. The image on the left shows comprehensive information relating to system operation, and the one on the right shows the performance of individual solar panels within the system. There is no better monitoring system available.